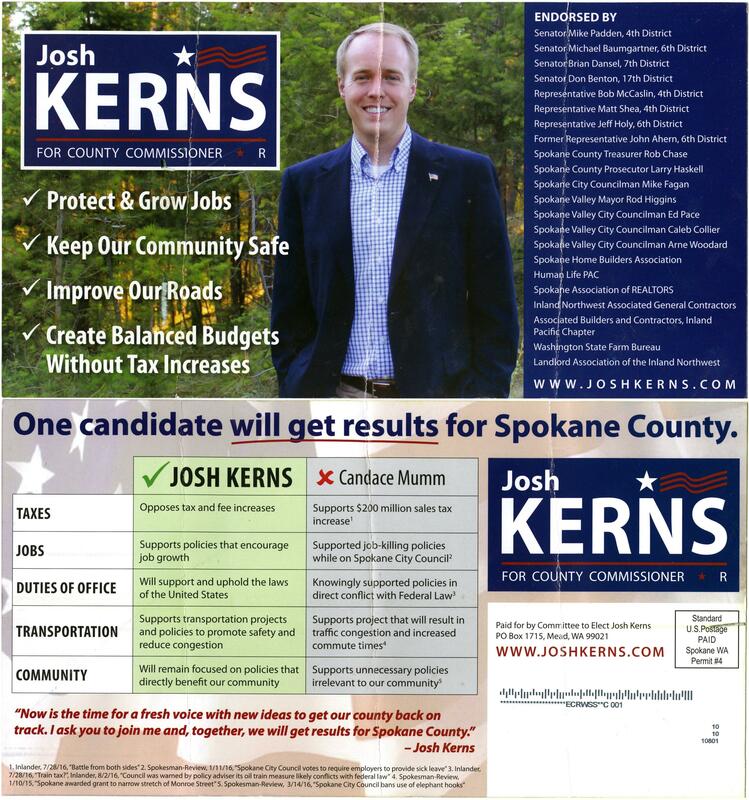 A campaign mailer for Spokane County commissioner candidate Josh Kerns. For the second time in his run for Spokane County commissioner, Josh Kerns’ campaign has distributed a mailer containing some dubious claims about an opponent. In July he targeted incumbent Nancy McLaughlin, signaling to voters that his fellow Republican isn’t a true conservative. Since McLaughlin was eliminated in the August primary, Kerns has set his sights on Candace Mumm, who’s running for the District 1 seat as a Democrat. In a mailer sent this week, he claims Mumm’s actions as a Spokane city councilwoman will kill jobs and exacerbate traffic problems. In fine print at the bottom of the mailer, Kerns cites articles in The Spokesman-Review and the Inlander – but those articles don’t necessarily support his claims. Here’s what he gets right and wrong. Cited story: “Spokane City Council votes to require employers to provide sick leave,” The Spokesman-Review, Jan. 11, 2016. Analysis: Kerns has repeatedly criticized Mumm for supporting a City Council ordinance that will require businesses to pay employees for up to five sick days each year. He claims it will cost businesses $24 million annually, citing figures from the Washington Policy Center, a conservative think tank. That statistic, however, was calculated using outdated national averages and heavily rounded employment numbers, some without an identified source. The Washington Policy Center assumed that 57,000 Spokane workers will begin receiving mandated sick pay, but City Council President Ben Stuckart, who is spearheading the implementation of the ordinance, said it will affect 40,000. The think tank also used the 2012 national average of how much sick leave costs employers, about 25 cents an hour. The city of Spokane commissioned several studies and arrived at an average of 11 cents to provide sick leave locally, Stuckart said. The ordinance won’t take effect until January, so its true impact remains to be seen. But the cost to employers likely will be less than Kerns’ figure. “It’s patently false to claim the ordinance will cost $24 million,” Stuckart said. Studies have shown that businesses in San Francisco, New York and other cities have lost few employees and little profit as a result of mandatory sick-leave policies. “By their own account, the vast majority of employers were able to adjust quite easily to the new law, and for most the cost impact was minimal to nonexistent,” researchers from the Center for Economic and Policy Research wrote of New York City’s ordinance. Washington voters will decide whether to enact a statewide sick-leave policy on Nov. 8. Cited story: “Spokane awarded grant to narrow stretch of Monroe Street,” The Spokesman-Review, Jan. 10, 2016. Analysis: Kerns opposes the $4.1 million “road diet” project on North Monroe Street, which would remove two through lanes on the stretch between Indiana to Kiernan avenues, leaving only two through lanes and a turn lane. The project, funded primarily by the state Department of Transportation, aims to increase pedestrian safety in the wake of crashes that killed a man in 2011 and a 5-year-old girl in 2013. The project has received support, although some have expressed concerns about backups during rush hour and access to a drive-thru restaurant. Kerns worried the construction would harm nearby businesses. He also noted that there are no turnouts on that stretch of Monroe, so buses stop in the lane, slowing traffic. “I’m sorry, but nobody can make the claim that that’s not going to cause congestion,” he said Thursday. That’s true, but traffic experts say the added congestion will be minimal. Over the course of a day, the average commute time from Indiana to Garland Avenue is about 4 minutes 30 seconds; the project will add just 10 seconds. Traffic experts previously thought wider roads meant better traffic flow, but new lanes also attract new traffic. Modeling shows the Monroe project will push about 15 percent of traffic onto other arterials during a 15-minute stretch of rush hour, said city spokeswoman Marlene Feist. Mumm, who represents northwest Spokane on the City Council, has said the project is one of her top priorities. She also sits on a board of neighborhood residents, business leaders and property owners overseeing the project. Cited story: “Battle from both sides,” Inlander, July 18, 2016. Analysis: Yes, she does. But it’s up to voters, not Mumm, whether the county’s sales tax will increase to pay for expanded Spokane Transit Authority bus service. It’s worth noting that the estimated $200 million would be raised over 11 years or more. The proposition would raise the sales tax one-tenth of a cent on April 1, 2017, and another tenth on April 1, 2019, with both taxes running through Dec. 31, 2028. The three current commissioners, all Republicans, are divided on the measure. Al French supports it, Shelly O’Quinn opposes it and Nancy McLaughlin has not taken a public stance. Proponents have said transit is a good way to alleviate traffic congestion in Spokane’s urban areas, but Kerns has made clear that he opposes all tax increases. Cited story: “Spokane City Council bans use of elephant hooks,” The Spokesman-Review, March 14, 2016. Analysis: Relevance is subjective, but it’s true that this ordinance probably won’t come into play anytime soon. The City Council banned elephant hooks, also called bullhooks, in March, citing concerns over animal cruelty. The implements resemble fireplace pokers with sharp, steel-hooked tips and are used to train and goad circus elephants into performing. The Ringling Bros. and Barnum & Bailey Circus, which brought elephants to the Spokane Veterans Memorial Arena last October and likely will return in the future, had previously said it was retiring its elephant act after 134 years. The circus held its final show featuring elephants in May. Kerns insists it was wasteful move. Cited story: “Train tax?” Inlander, Aug. 2, 2016. Analysis: Interestingly, the Inlander story Kerns cited for this claim doesn’t mention Mumm. She did, however, join five other council members July 25 in voting to put a railroad initiative on the November ballot. The measure would have charged railroad companies a $261 fine for each car of crude oil and uncovered coal that passes through downtown Spokane. Council members hoped the measure would send a message to federal lawmakers and regulators about the dangers of oil-train derailments. Opponents accused the City Council of targeting fossil fuels for political reasons, despite other dangerous chemicals being transported by rail, and said passing the ordinance would snarl the city in unnecessary lawsuits. Mumm and four other council members later voted to remove the proposition from the ballot, citing additional legal advice. Beggs now is working to put a different proposition, targeting shippers rather than railroads, on the November 2017 ballot. Published: Oct. 28, 2016, 3:46 p.m.